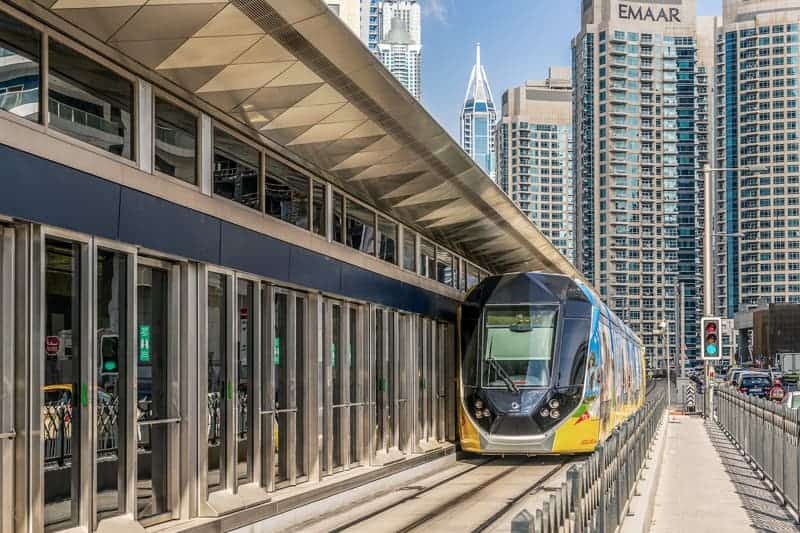 This Dubai Tram station serves the northern end of Jumeirah Beach Residence and Dubai Marina. 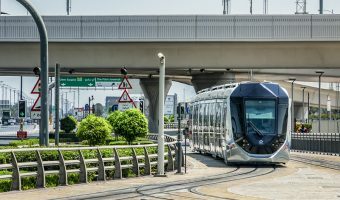 It is convenient for those staying at the Hilton Dubai Jumeirah, Oasis Beach Tower, Movenpick Hotel Jumeirah Beach, or the Ritz-Carlton Dubai. Attractions and other places of interest nearby include The Walk and The Beach (including Roxy Cinemas The Beach). 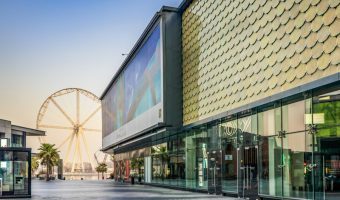 Reel Cinemas Dubai Marina Mall (0.2 miles) - Small cinema at the Dubai Marina Mall. Roxy Cinemas The Beach (0.3 miles) - 10-screen cinema at The Beach. Dubai Marina Mall (0.3 miles) - Shopping mall at Dubai Marina. The Walk (0.3 miles) - Shopping and dining promenade at Jumeirah Beach Residence/Dubai Marina. 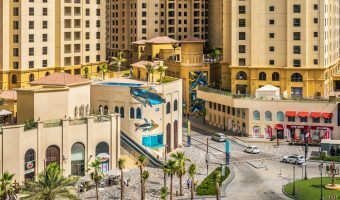 The Beach (0.5 miles) - Open-air mall at Jumeirah Beach Residence. Marina Social (0.1 miles) - Restaurant at the InterContinental Dubai Marina. Offers a British menu with Mediterranean influences. Led by Jason Atherton, a Michelin-starred chef that has worked with Gordon Ramsay. Friday brunch. Soul (0.1 miles) - Restaurant and lounge bar the Movenpick Hotel Jumeriah Beach. Offers a menu inspired by the neighbourhoods of New York (Little Italy, Harlem, Meatpacking District etc.). The Talk (0.1 miles) - All-day dining restaurant at the Movenpick Hotel Jumeirah Beach. Offers themed nights and a Friday brunch. Features open kitchen, live cooking platforms, indoor seating and outdoor terrace. Fogueria (0.2 miles) - Brazilian churrascaria on the rooftop of the Ramada Plaza Jumeirah Beach. Offers an all-you-can-eat Brazilian BBQ and live music. Offers great views of Dubai Marina. Mazina (0.2 miles) - All-day dining restaurant at the Address Dubai Marina. Serves a variety of cuisines from around the world. Show kitchens. Friday brunch. Shades (0.2 miles) - Terrace lounge and restaurant on the fourth floor of the Address Dubai Marina. Overlooks the hotel’s infinity pool and offers good views of the Dubai Marina. Live entertainment and DJs. Blue Jade (0.2 miles) - Pan-Asian restaurant at the Ritz-Carlton Dubai. Menu offers dishes from Vietnam, China, Thailand, and Japan. Amaseena (0.2 miles) - Outdoor restaurant in the grounds of the Ritz-Carlton Dubai at Jumeirah Beach Residence. Dine under the stars in Bedouin-inspired tents. Menu is Arabic buffet. Wavebreaker (0.3 miles) - Casual beach restaurant and bar at the Hilton Dubai Jumeirah, The Walk, Jumeirah Beach Residence. Offers burgers, smoked and grilled food, sandwiches, salads etc. Happy hour. Large screen TV shows big sporting events. Massimo's (0.3 miles) - Italian restaurant on the promenade of the Dubai Marina. Inside and outdoor dining areas. Italian chef. Not licensed to serve alcohol. Rhodes Twenty10 (0.3 miles) - Steakhouse at Le Royal Meridien Beach Resort & Spa. Led by British celebrity chef Gary Rhodes. Eggspectation (0.3 miles) - Menu offers a wide range of breakfast items and egg-based dishes, but also includes salads, burgers, sandwiches etc. Indoor and outdoor seating. Zengo (0.4 miles) - Pan-Asian restaurant and lounge bar at Le Royal Meridien Beach Resort & Spa. Stylish interior. Indoor and outdoor seating. DJs, ladies nights, and lively bar. Indego by Vineet (0.5 miles) - High-end Indian restaurant at Grosvenor House. Led by Vineet Bhatia, a Michelin-starred celebrity chef. Impeccable service. Sloane's (0.6 miles) - Buffet restaurant at Grosvenor House. Huge choice of dishes. Best known for its Friday brunch. Buddha Bar (0.6 miles) - Large restaurant and bar at Grosvenor House, Dubai Marina. Opulent two-floor layout. Floor-to-ceiling windows offer fantastic view of the Dubai Marina. DJs and party nights. Toro Toro (0.6 miles) - Latin American restaurant and lounge at Grosvenor House, Dubai Marina. Two-floor venue with upstairs bar. Friday brunch and ladies’ nights. Map showing location of Jumeirah Beach Residence 1 Tram Station.